Next week we’re going to look, dollar by dollar, at how one Freelance Mom built up her income over a year and a half to the point that she now is hiring help to run her food tour business; but this week, I want to look at a different side of the business cycle. What about those of us that have been running our businesses, with a level of relative success, for several years or even decades, but feel like we’ve hit a plateau? Mridu Khullar Relph is not your average freelance journalist. Sure, she’s been published in The New York Times, Time, Elle, and CNN, but all while based in India and often commanding higher rates than her counterparts in the U.S.
After freelancing for ten years, including a more recent stint as the sole breadwinner in her family while her husband also began freelancing and her son was still in diapers, she had had enough of the feast or famine cycle so familiar to self-employed women. It’s a sentiment many of us can understand. If we just had a certain amount of our income that we knew would come in every month without any extra work or stress: how much mental space would that clear up for the rest of our work? Initially, as she was already running a popular blog, Mridu dabbled in popular online content models, such as e-courses and e-books, and she also created a collaborative content-driven site on the side as an experiment. But as many of us learn, especially when starting out, trying to immerse ourselves in several different types of work at once can be more draining than income generating. With her gaze shifted back more specifically to writing, Mridu revamped her website, solidified her brand, and clarified who her audience was and how exactly she would reach them. She launched a new set of flagship courses, using one of the tips she hits most heavily on in her new book, The Freelance Writer’s Guide to Making $1,000 More This Month: earning more money from content you already have. The book itself is both a compilation of 14 areas in which freelance writers can earn more income each month—and, honestly, each could easily generate more than $1,000 per month on its own—and a continuation of her quest for that extra $1,000 without all the marketing time and extra work you’d expect to put in to bring in that extra bit. If you’re a writer, the book contains a wealth of actionable tips as it’s written expressly for writers already familiar with the basics, so it gets right to the meat of what you need. For non-writers, many of the sections, such as “Do an LOI blast,” “Send Out Those Reprints,” and “Tap Your Sources,” seem a bit inaccessible on the surface, but they contain valuable lessons regardless of what type of freelance work you do. (1) I’m female. (2) I’m Indian. So a large part of why I’m such a huge fan of negotiating rates and fees with clients and editors and getting a great deal is because I’m a woman and boy, do we love a bargain. Also because I’m Indian and boy, do we love a bargain. It’s hardwired into my genes, I can’t help it. Why not ask for double or 50% more money every time you are working out a price with a new client? It’s certainly scary, but the worst they can do is say no. If they say no and they don’t want to work with you as a result, it means they’re always going to want more from you than they can pay for, and you’re better off replacing them with a client who better values your work. This works with new clients, but what can you do right now? You can always ask your existing clients for a raise if you haven’t in a while, but there many be other easy wins hiding in your inbox. Do you have an excellent proposal you put together for a client that didn’t pan out? Send that proposal out to another prospect that didn’t work out. Maybe the new tack will be what you need to close the deal. In the meantime, follow up with the client who demurred at the proposal and see if they’ve come around. The majority of The Freelance Writer’s Guide to Making $1,000 More This Month chapters deal with this theme, because it is the most important way to maximize the time you put into your business so you can still have time for yourself and your family. For journalists, there are some clear cut ways to resell the work you’ve already done, but it becomes an issue of who owns the copyright, since journalists are inherently selling rights to their writing as their business model. Coach clients by phone? Can you reuse your words of advice on common issues into blog posts or other information products? Design wordpress blogs? Can you remove the branding elements and make a more general version of some of the sites you’ve recently created that you can sell as a wordpress theme to an audience that couldn’t afford a custom site? Advise clients on social media? Can you reorganize some of your emails into information products you can sell as an intro offering in your sales funnel? 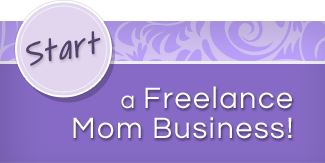 While this is one area that is relatively specific to what type of work you do, there are a few easy ways that every Freelance Mom can apply this principle. Now that you know how to make more money for the same work, create a mechanism to make it easier. Add an upsell to your proposal template or a request for referrals to your invoices. Create an e-book outline you can dump relevant blog or email text into as soon as you write it or set up a transcription software to transcribe your calls into text you can use on your blog or other marketing or in other information products. Ask for feedback and testimonials automatically with Freshbooks’ handy new feedback feature. Keep a fresh testimonial in your email signature at all times on emails to old and new clients. What can you do this month to add an extra $1,000 to your cash flow?